While recently passing through picturesque Beaumont Village, a flash of streamlined chrome caught my eye. Among the crafty gift shops and a neighborhood hardware store, two signs hang above an entrance, popping with yellow and black against the gray. One a blackbird, the other a fallout symbol made out of cheese wedges. 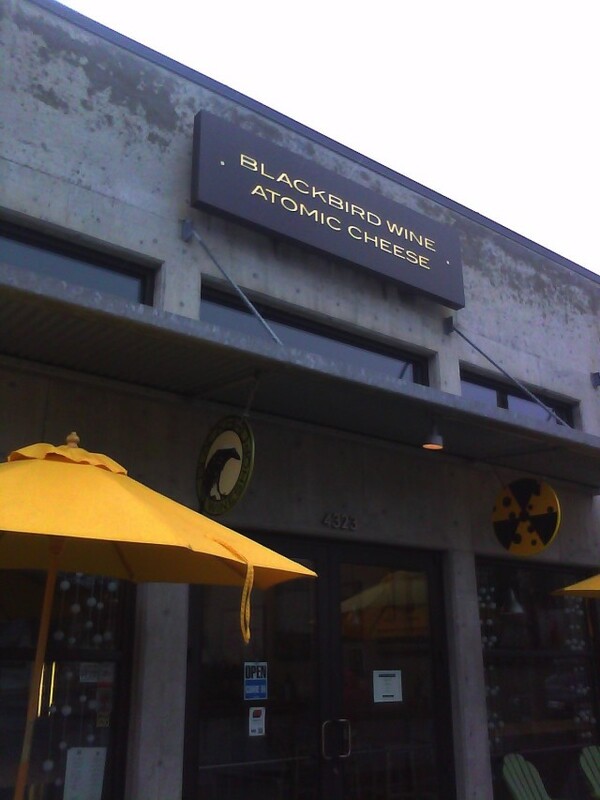 It reads: Blackbird Wine, Atomic Cheese! It didn’t take much arm-twisting for me to decide that I would tarry a moment, trading the drear and rain for a respite of rich dark wine and artisan dairy products. I wandered in past a sign announcing the “Hours of Happiness” to an open space of natural wood bar tops and tables, bold splashy art, and stainless steel. The walls are stocked with wine; New World on one side, Old World on the other, with Oregon and Washington wines at eye level beneath a large classroom map of the world. Right away I am welcomed by owner Andy Diaz and offered a selection of about 10 open wines. Out of the Tempernillos and Toscanos, French and Argentine, my host suggests a pour of Evodia’s 2010 Old Vine Grenache from Spain: a smooth, gamey red with notes of cinnamon and coffee, sourced from vines planted over a century ago. This is a wine shop with accessories, chocolates, olives, oils and spreads, but also a wine bar/café with wines on tap, a beer selection in a well stocked fridge, and a counter full of enticing cheeses and charcuterie items from around the world, as well as from Seattle cheesemakers Beechers and local meat artisans Chop. These gourmet deli ingredients are put work in the open kitchen to construct a variety of hot melty sandwiches, such as sopressata with caramelized onion marmalade or taleggio with mushrooms, all made on bread from local bakery Little T. You can add a green salad with roasted beets, or sweeten the deal with the reportedly raved about Toasted Chocolate Sandwich. 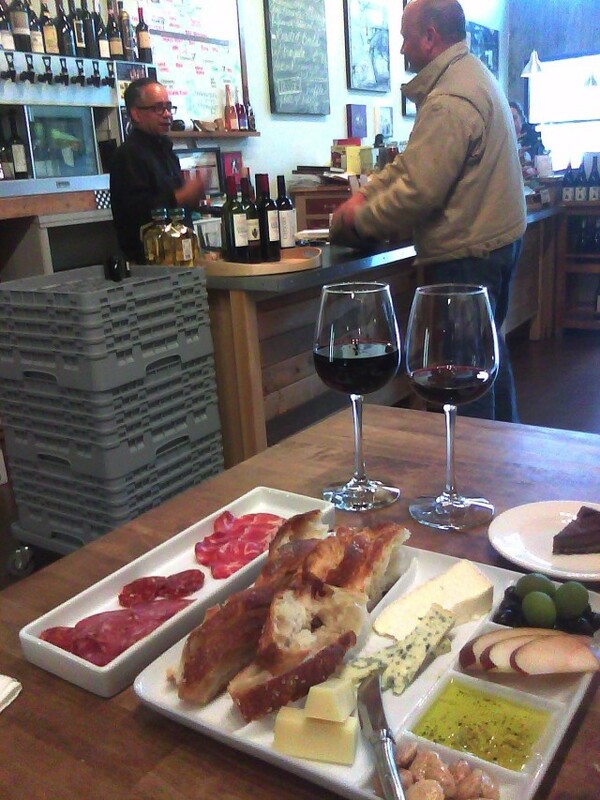 The Happy Hour specials (4pm-7pm, Tues-Sat) are priced somewhat higher than traditional bar fare, but for a wine lover on a budget this shop, with its array of over 300 labels and international meats and cheeses, has prices and an atmosphere that are friendly. Diaz calls it "controlled hedonism." Most bottles are in the $20 range, with glasses of select wines running $6-7. Charcuterie dishes are great for sharing; you can build your own cheese plates or order off of the menu (try the Paris Plate), and a generous sampling of delectable meats can be added for just $5. The Perfect Pairs portion of the menu offers high-end selections of cheese and/or meats (say $30/lb) paired with a recommended glass of wine for $12 . There are also special events: wine tastings every Thursday and Friday nights, First Wednesday art openings, and a special literary geek gathering on Second Tuesdays that involves hanging out and enjoying wine and beer, having something from the kitchen (specials such as lamb osso buco) and writing improv short stories that are shared and voted on for prizes of food and drink. In the kitchen under a floor-to-ceiling blackboard on which Diaz has rendered Portland under a cheese moon, he prepares me a plate stocked full of various cheeses including blue and triple cream brie, pate with truffles, fresh pears, olives, and marcona almonds. He grates lemon zest and fresh pepper into olive oil for dipping Little T’s salt slab foccacia, and asks if I eat meat, and if I like spicy before he slices marbled prosciutto and Chop’s spicy soppressata to go with a glass of tart, peppery Sangiovese. A former video producer whose bio includes filming a Puerto Rico episode of No Reservations with his friend Anthony Bourdain, Diaz’s passion for food and wine and Portland’s easier affordability led him here from New York City back in 2007. He has been sharing small vineyard wines since opening his first bottle shop in the Lower Fremont/Beaumont area, which he later expanded to include his second venture, Atomic Cheese! and moved around the corner into the current, larger space. And he’s a busy man. During my visit Diaz multitasks through three visiting wine distributors offering him everything from vegan wines to voignier, and a cheesecake vendor sharing samples of cocoa cheesecake which we spontaneously pair with a spring heralding rosé from Southern France. As the head cook stops in to discuss a new menu, Diaz’s cell phone rings, and as soon as he hangs up the store phone rings. This pattern goes on for a while, possibly due to temtative plans for a second bistro location in the Pearl (details are still emerging). Mornings are planned to feature specialty hot breakfasts and coffee, in collaboration with Northeast neighbors and exotic coffee roasters Ristretto, shifting in the afternoons and evenings into a wine and cheese bar serving Diaz’s gourmet grilled cheese sandwiches, along with a brand-new tapas menu. I, for one, will make it a stop on my eating itinerary.